For several years, when I lived quite another life in northern California, I bought and sold and amassed collections of all manner of 1920s-1950s stuff. (The selling was a direct result of too much amassing.) I no doubt trekked dozens of miles at antique malls and outdoor flea markets, searching for everything from colorful pottery and catalin jewelry to lucite purses and Art Deco chrome. But I digress. Anyway, yesterday I put the sheep in a large Donkey Daycare Grazing Pen for a while. There are two enormous sycamore trees in this pen, and below them are piles of large branches that broke off during the recent storms. During their midday rest period, the sheep happily nestled in the shade amongst the debris. While I was carefully picking my way through it to check on everyone, I found this glorious nest laying on the ground--no doubt knocked out of the sky along with all of the branches. I probably have at least two dozen bird nests by now. Most of them are startingly different from one another, but even the ones that were obviously crafted by the same species of bird are each unique creations. I don't think there will ever be a time when I am not in awe of a bird nest. I become mesmerized and find myself staring at them, trying to figure out how in the world I could even come close to constructing something so precise and perfect using nothing but my mouth. Most of my bird nests are between three and four inches wide, but this new one measures six inches across. It is somewhat similar in size and shape to this nest I found last year. While I have yet to find the time to research what types of birds built each of my nests, I know exactly what kind of bird built this one--a very smart one! This has got to be the warmest, woolliest bird nest in the world. Click here if you would like to see the underside and a close-up of the construction detail. I think this is a good time to mention that I only collect bird nests that are obviously no longer being used. Most of them are found on the ground. I do have a couple of nests that still contained teeny tiny, unbroken eggs when I discovered them, but even these had obviously been abandoned. Someday I will get around to photographing more of my collection (and some other day we will build a proper case in which to display them all). Each of these nests is truly a work of art. And as you can see, I easily get carried away talking about them. Looking back each day at the photo I posted a year ago has been very interesting. I don't look ahead, preferring the daily surprise instead. This means (as you may have noticed) that sometimes I find myself posting new photos that are amazingly similar to ones I posted right around the same time last year. The surprise lilies are a case in point. But rather than feeling embarrassed by these inadvertent repetitions, I am taking comfort in the fact that although it often feels as if everything is always changing, there are some things around the farm that do remain the same year after year. And fortunately many of them are things of quiet beauty (or cuteness). Isn't is amazing how the rythym of life can have it's comfort though too? Even though it may seem it "repeats" in a cycle of sorts, there is nothing that is aways exactly the same as before, but its similar enough that we find solace in that "sameness". I collect bird nests and heart rocks too! After storms my boys and I like to survey our land for any fallen bird nests. The one I have been most intrigued over is a "double wide" built on top of a stack of toys on our back deck. A batman cave covered the toys, and the little bird would fly in and out of the cave opening. I'm not sure why she would build two nests within one, and the eggs she laid were as tiny as a jelly bean with little red dots on them. I think living on a farm you come to appreciate the simple things - thus my love for heart rocks and bird nests! I like your observations about the surprise of each new day, and your photos certainly do reflect your outlook. Indeed, looking back at the pix of a year ago really brings us to a different place. And there's a lot to be said for waking up not knowing what new beauty Nature will bring us today. Great photos, as always--what a gorgeous bird's nest that is. The wild birds at your house are grateful for the sheep, to be sure! I put out wool after the sheep were sheared and couldn't tell if the birds took any or not. I thought they would so thanks for sharing. I've also used some for mulch in the garden. I've washed some and used it for a cat bed. Won't be spinning it, but if you have other uses, I'm interested. I have a heart rock, other rock and natural material collection going too. Amazing you only have to step out the door to find inspiring art. I also love the items I remember as a child in my grandmother's house. I have some of her's and others I've picked up and use. The dichotomy of life. We find comfort and boredom in the routine and both fear and anticipate what lies ahead. A fellow bird nest collector! 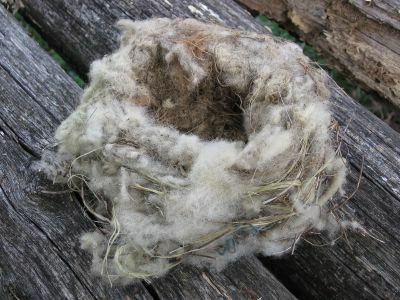 Is that sheep wool woven into the nest? How appropriate. I know exactly when and where my collection started. It was a nest I picked up ten years ago in the Dominican Republic and carefully snuck through customs. I wonder what compels we people who collect the discarded. I think that bird's nest looks like it would make a nice scarf which would be particularly useful here in chilly SF. Now I'm having nest-envy! It's sure a keeper with everyone's wool in it. Ilama too? I'm a quartz freak, and have an herb bed made with it. Quartz speaks to me as I walk, then it lines my pockets. Rocks speak to me also. Two favorites are sitting on my desk - one from a canyon in Sedona, the other from a river in the Swiss Alps. Their quiet power helps ground me when things get crazy. That looks very cozy. In my barn, the birds make use of the horse hair from a mane or tail that might have gotten caught in a branch or on the fence. My little boy loves birds nests too. I am going to look more closely at them from now on. I am obviously missing something quite lovely! Sometimes in the spring I'll take a favorite old worn out t-shirt or sweatshirt, rip it into ribbons, and leave them out for the birds. I've discovered a few nests that utilized the material, which was pretty neat! I have heard that if you snip your leftover, bright colored yarns and ribbons into pieces and scatter them about the yard it will help you spot the nests while they are still in the trees. Then, you can keep an eye on them until the nests fall to the ground. Nice idea from Marylou/tx. You know FG, in a way you do 'construct something precise & perfect using only your mouth' your blog, silly!! Look at all of the great comments and joy to be found on these very pages. I just got sent a stupid email with pics of millionaire's boats & planes meant to 'motivate or depress' me - it did neither. These gin palaces have nothing in life that I want or need. I think I'll return the favour and send them a weblink to your blog - perhaps they'll 'get' the message then. I thought I was odd because I love to look at fallen/discarded birds nests. My husband acts like I'm weird. It's good to know I'm in good company. I love this blog! Thanks Farmgirl! Here I am in the "burb," but really "there" on the farm with you! When I place my head on my pillow nightly, I drift to the peace and quiet (well, maybe not that quiet) of your farm. It is so awesome to read of others who enjoy the simple joys of what our beautiful planet has to offer, if we will only pause to take a peek. Thanks Farmgirl & Friends who post! What a gorgeous, cozy looking nest! I leave my dog's hair outside after I brush her, hoping that it will keep some little bird warm at night. It's nice to see that some of them put such fine resources to good use. I have to tell you that while I was on vacation last week, I stumbled upon the most amazing heart rock on the beach and thought of you. I guess I've got the beginnings of my own collection!